What happens to you when you die? Perhaps you remain on Earth a tortured soul unable to rest in peace until you resolve all of your unfinished business. This is the sort of limbo Frank Herlihy (Greg Kinnear) has found himself stuck in for over a year following his untimely demise on the streets of Manhattan. He and many other disembodied spirits roam around the city invisible to humans but not to each other, utterly frustrated by their inability to communicate with the living. Hope for bridging the gap arrives the day that something goes horribly wrong during Bertram Pincus’ (Ricky Gervais) routine colonoscopy, an anesthesia accident that leaves the dentist dead on the operating table for seven minutes or so. 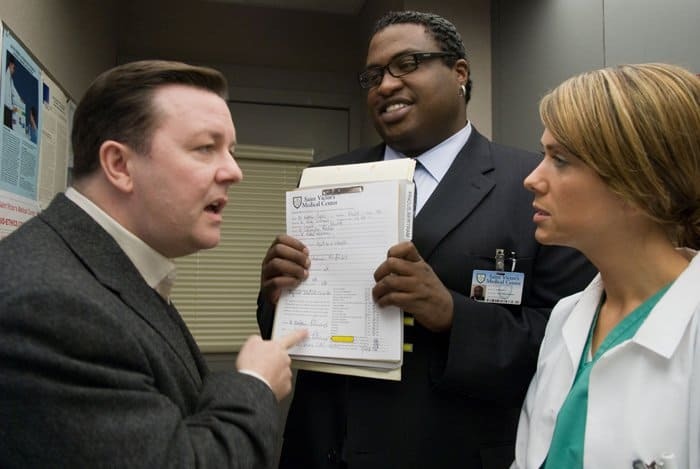 His surgeon (Kristen Wiig) decides to hide the truth about what happened from him on the advice of the hospital’s attorney (Michael-Leon Wooley). Still, once revived, it doesn’t take the patient long to recognize that something is different, because he can suddenly see ghosts. And this development is not lost on the spirits themselves, either, and they start pestering him to intervene with long-lost loved ones on their behalf. But to begin with, Bertram is a self-absorbed misanthrope not inclined to do anything for anybody beyond the basic services he and his partner, Dr. Prashar (Aasif Mandvi), provide as part of their bustling dental practice. For instance, when a neighbor burdened with packages asks him to hold the elevator, he deliberately pushes the “CLOSE” button instead of waiting for her to reach the door. That woman, Gwen (Tea Leoni), happens to be the aforementioned Frank’s widow, and she’s already engaged to remarry an attorney named Richard (Billy Campbell). Frank, who has been lurking around the apartment building hoping to sabotage their impending nuptials, befriends Bertram, and the two soon cut a deal. Bertram promises to help prevent Gwen from walking down the aisle with a con artist who is supposedly only interested in her money. In return, Frank agrees to keep all the other ghosts annoying Bertram at bay. However, what nobody anticipates is that Bert might develop feelings for Gwen, too, and the novel love quadrangle which ensues is the hub around which Ghost Town revolves. Directed by David Koepp, this offbeat sitcom might be best thought of as a bittersweet cross of Ghost (1990) and The Sixth Sense (1999), as it combines some of the former’s romantic elements with the latter’s “I see dead people” theme. Moreover, the pleasantly-unpredictable Ghost Town adds a few surprising wrinkles of its own into the macabre mix which make it almost feel like a totally fresh concept. 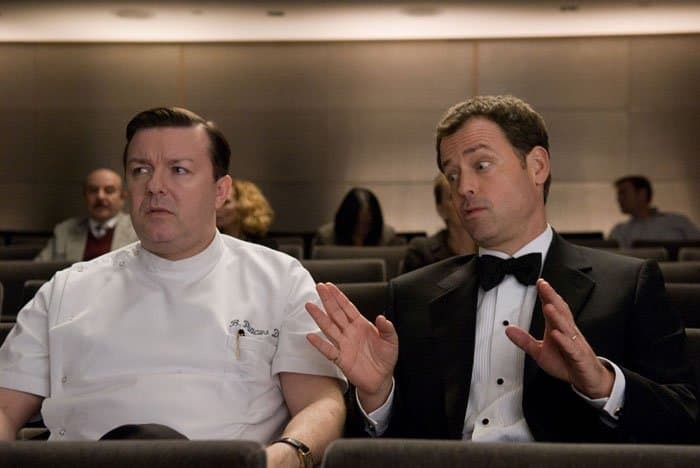 This Ricky Gervais vehicle is likely to work for you to the extent that you enjoy laughing at the insufferably stuffy Brit cliche he has practically perfected here, a coldhearted cad who ultimately experiences an 11th-hour epiphany right on cue for the flick to deliver a universal message about what really matters in life. I just hope it’s okay if I enjoyed the original Bertram more than his sappy alter ego. Rated PG-13 for sexuality, profanity and drug references.